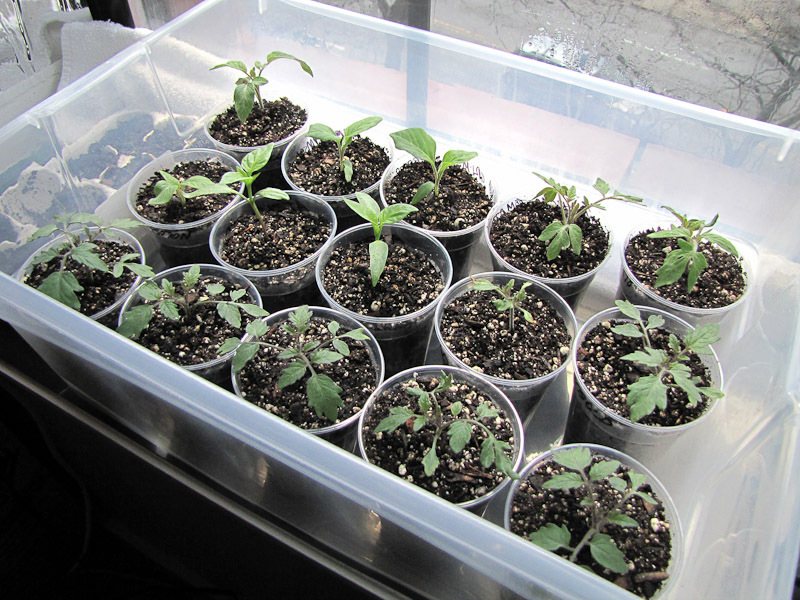 Now that most of the seedlings are 2 or 3 inches tall and have a few sets of leaves it's time to pot them up. Potting up is simply the process of planting seedlings in a larger container so that their roots have more room to grow. All nice and snug in their new home, 9 ounce cups with holes poked into their bottoms. I used to use the larger, red party cups, but they took up too much space on the windowsill so I downsized. I only pot up once before they go on the roof, but I would pot up a second time if a seedling's roots started circling the bottom of the cup. By correctly timing when to start seeds I'm trying avoid this extra work. My eagerness to garden always makes me wonder if I started seeds too early, I'm hoping this year I timed it just right. Bottom watering is the quickest way to water a group of seedlings. 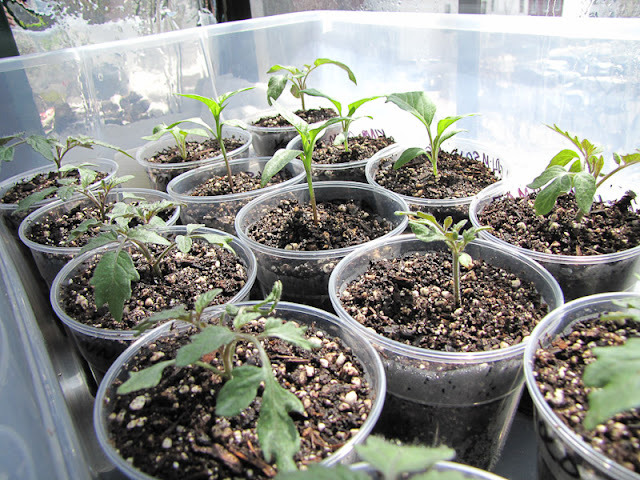 Place the seedlings into a watertight tray, fill the tray with an inch full of water and let the seedlings sit for awhile to soak up the water. Once enough time has passed, at least half an hour, drain the excess water from the tray. Once seedlings are potted up I start feeding them liquid fertilizer. Once a week I bottom water the seedlings with fertilizer diluted to 1/4 strength. I've been using the fertilizer I got free when I bought the seed starting tray and dome, but it will run out eventually so I've been shopping around looking at my options. Do you have favorite liquid fertilizer? 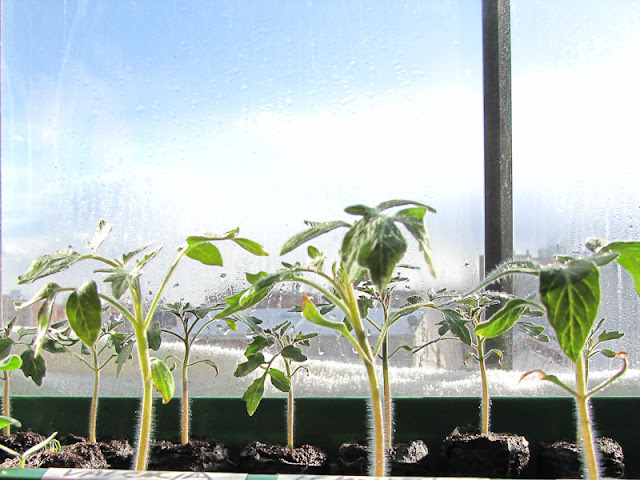 Potting up is also when I stop hovering over the seedlings like a baby boomer parent. If seedlings make it to this stage it's smooth sailing (hopefully!) until hardening off. I think I am using something called Neptune fish fertilizer. I didn't want to pot up, but its at least a month before considering putting them in and they are so big already! I think I'll be forced to pot up the tomato seedlings. I buried them when I potted up so their roots are already very close to the bottom of the cup. Thanks for the fertilizer suggestion. I use a fish emulsion, the brand name escapes me right now, but I can find out if you're interested. The only thing about fish emulsion is that it's really stinky. I thinks it's a secret requirement that all liquid fertilizer must smell like sewage.